These large flying Heartless put the wind to expert use when attacking. They move swiftly, but are vulnerable just after kicking, so be ready to mount a counteroffensive. They also retain their kind's immunity to Aero magic. The Artful Flyer is an Emblem Heartless that is found in Kingdom Hearts 358/2 Days. An Artful Flyer is a vaguely humanoid Heartless with navy blue skin and two large, blue, curled wings. Its head is spherical with a jagged mouth and glowing yellow eyes, and it is mostly covered by a blue helmet. This helmet is adorned with two conical, white spikes on either side, two angular, yellow spirals on its front, and a curled, blue antenna on its top. Most of its body is also covered by light blue armor, with its Heartless emblem emblazoned on its abdomen. The Artful Flyer's legs end in small, white spikes and it holds a gold punching weapon lined by white spikes in each hand. The Artful Flyer's name refers to its skill and speed in flight, as "artful" can mean "skillful". The Artful Flyer dives at Roxas. 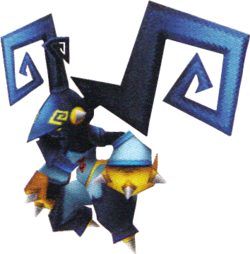 The Artful Flyer will try to hit Roxas with its two arms together, in a "v". The Artful Flyer will release an attack similar to the Antlion's Whirlwind Shield. The duration is much shorter, though. It is invulnerable during this attack. The Artful Flyer will spin in a yellow circle and dive at Roxas. All of these attacks have a chance of activating the Air-toss status effect. When found, simply Lock-On to the Heartless and begin pounding away at it with magical attacks, for its attacks are somewhat unpredictable. Jumping to attack it can result in a large amount of damage, so stay at a distance and just avoid its attacks while using magic. When it dives at Roxas when he is on the ground, chain Dodge Rolls to avoid it, then resume the attack. Thunder and Fire magic are effective against the Artful Flyer, avoid using Aero as it is immune. This page was last edited on 1 May 2018, at 18:54.